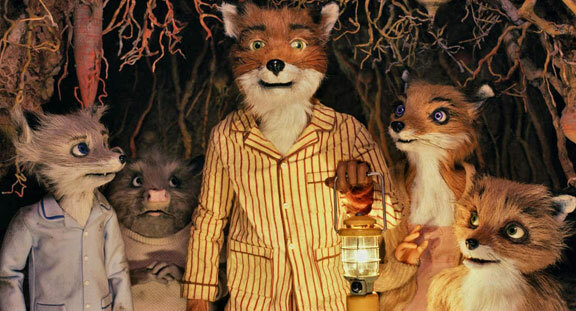 Fantastic Mr. Fox, a stop-animation movie adapted from Roahd Dahl's children's book by unconventional auteur Wes Anderson, tells the story of Mr. Fox, a fox-about-town going through a fairly typical mid-life crisis. Now that his wife is a mom, and they have a pup to raise, he's vowed to settle down and stop the dangerous occupation of chicken snatching: but Mr. Fox yearns for his daring days of old, and to perform just one more glorious caper. Unfortunately, his caper goes up against three of the meanest farmers in the neighborhood: the imposing trio of Boggis, Bunce, and Bean. This simple story has been rewritten by Anderson to focus, more than the original fable, one thinks, on Anderson's typical obsesssion with the existential despair of small family moments. Hence the character of Christopherson - Mr. Fox's nephew, who comes for an extended visit during Foxy's schradenfreud, becoming a rival to Ash, Mr. Fox's nerdish pup. Let me say here that I've never been a big fan of Wes Anderson (his movies have never really gelled for me), but in working with Dahl's material, I think he finally here finds his voice - and the merging of eccentric fairy tale with existential family dynamic and the endearing quality of decidedly low-tech stop-animation produces just the right combination of quirky introspection. The best thing in the film, by far, is the catchflung animation and the whimsical way in which the tale is told. By one small example: in explaining the complexities of the animal sport of Whackbat, a crickety thing with several layers of intricate complexities, we're presented with a non-sensical litany of quick rules performed in a monotone by Owen Wilson, all to comic effect. The joke is even better in the second go-around when Ash spontaneously performs his own real-life (stop-time life, whatever) Whackbat impression while getting his father Foxy and Dad's accomplice Kylie out of a tough life-threatening spot with farmer Bean. Seeing it all done with cute stuffed animals makes it even more entertaining. By the way, that Bean is a determined sucker who pulls no punches in trying to hunt down Foxy and his hoard of animals. The relentlessness is a bit dark for younger children, but does a good job of capturing the heightened drama of adolescence and its sense of irreversibility. That is to say, I've always found existentialism to be a bit of a juvenile philosophy - lacking the stern conviction of nihilism, the formal rigors of phenomenology, or the literary complexities of a full-blown moral universe. But it does suit well a young mind struggling with the unfairness of life and searching for a reason to enjoy it all anyway. That seems to be the focus of the tale here: as much that Ash discovers his own inner fox despite his father's favoritism for his cousin; as it is Mr. Foxy freeing himself from the stultifying shackles of civilization to re-ignite his youthful, foxy nature. What Anderson is saying, apparently, is if you just stop all that worrying, your sleek animal nature will save the day. Call it "Old Dogs" meets "New Tricks." Like a kid who wants a good excuse to skip school, the story labors laboriously to explain why rakish irresponsibility is cute, and good for an old fox. Mr. Fox's pontifications on the subject hardly make sense, but never-you-mind: it's really more Wes Anderson's movie than it is Roald Dahl's, which means it's really not at all about being a good husband or father or any kind of believable leader: it's just about growing up an awkward child, being challenged, and overcoming odds. Even the sly Mr. Foxy is just a big kid at heart, eager to be appreciated. I, for one, find the animation and writing thoroughly entertaining most of the way through, so I think this time, the kid deserves his due. A movie review site where we discuss the deeper meanings of movies, culture, storytelling, and movie making. Martin Schecter, author of cincritic.com, is a former movie critic for the Arizona Wildcat and book reviewer for the Philadelphia Inquirer. He attended the NYU Cinema Studies program and has an MFA from the University of Arizona. He is also the former Executive Producer of the movie-review website, On2Movies.